Last week my accountant called me with a problem. He was having problems printing anything to the Kyocera printer . He has a Kyocera Mita KM-1650 KX printer connected to his SBS 2003 Server via the network. 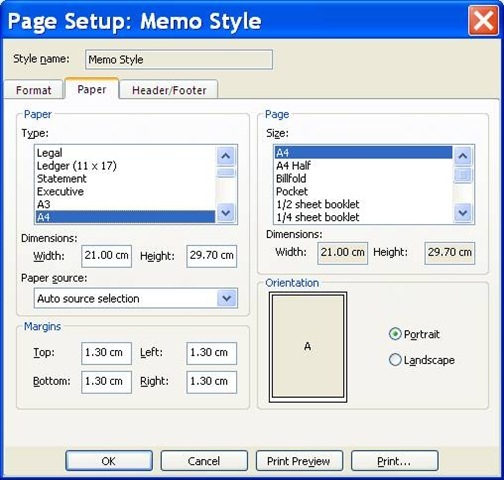 All users print to this main printer as their default printer. I asked him over the phone exactly what that meant and in typical client fashion he told me that anything I try to print to the printer won t work . Ok he s just around the corner so I thought I ll drop in and see what the problem is. I arrived onsite and he was not there, so I was left to my own investigations. Here s how I tackled the problem. Question 1 When did the problem start? According to the secretary, he s had the problem for a while, but they are not sure when the problem started. Ok this is good but not definitive. Question 2 Does the problem affect all users or only this one user? Again the secretary says that the problem only affects this one person. All other users can print just fine. Question 3 Given the problem only affects one user, is it with all applications or only one or two? At this point the secretary is unclear, so it s time to get onto the computer and see for myself. First thing I did was to try to reproduce the problem. 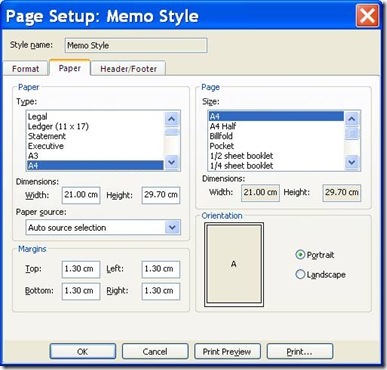 On the users desktop, I went into Printers under Control Panel and printed a printer test page. This worked just fine. Therefore I figured it had to be an application level problem. I opened up Word 2007, typed in =rand(10,1) and pressed enter. This is a cool shortcut that will generate a page of text. You can play with the numbers and get more text, multiple pages and so on. Anyway once i had a page of text, I hit the print button and waited. The page printed just fine. I opened up Excel 2007 (no cool shortcut there), typed in numbers in a few columns and hit Print again. Again the page printed just fine. Ok so two key apps work fine. I opened up Outlook 2007, opened an email and hit Print. Ok it sent the print job to the printer and the printer displayed Print Mode Error on the LCD screen and locked up. I had to power the printer off and back on again to get it to respond. Looks like we have a problem then with Outlook 2007 printing to the printer. Ok so first thing was to check the printer properties for anything strange. I went to the printer and checked things like page size etc. Sure enough it was set to A4 paper which is the standard here in Australia. Nothing too out of the ordinary at all really. Ok so I had to have a hard think about this. 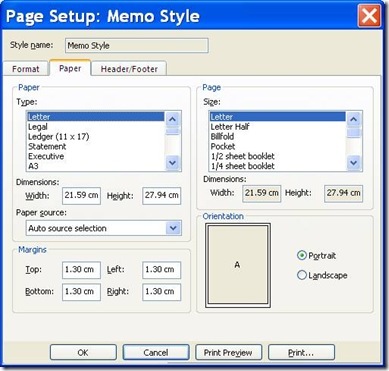 What was different about printing from Word 2007, Excel 2007 and Outlook 2007? The answer was the Page Setup. I checked the page setup from without Outlook 2007 and got the dialog on the right. 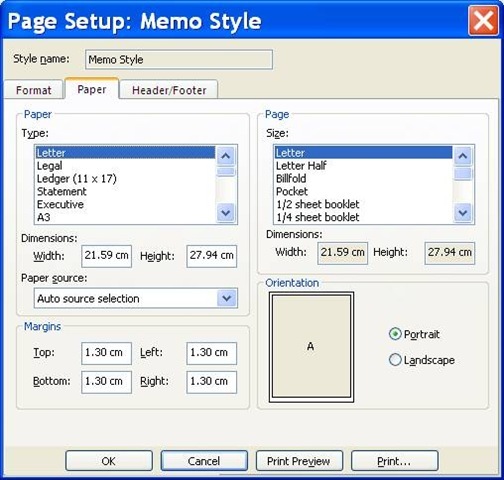 You can see that the paper type and size is set for Letter. Ok that should not cause a problem really but given we are using A4 paper, I decided to give that a shot and change it to A4. I then hit print again in Outlook 2007 and was surprised to see that it printed out just fine. Ok so was it just the paper setting that did it or was it something else? I hate to resolve a problem by accident, so I decided to set the paper back to Letter again and test it. If this was the problem then for sure it would fault again with the Print Mode Error. Sure enough it did. Cool I had found the problem. I reset the Page Setup in outlook for the emails to A4 and tested one more time. Worked fine and I was done! All up the entire problem took less than 5 minutes to investigate and resolve. In fact it has taken longer to write this blog post than it did to resolve the problem. I hope that the solution helps you but also that the methodology that I used to investigate the problem is of some use to you as well.